The need for a shift away from property to non-property and usufructuary rights in relation to animals and their welfare. This essay considers the legal status of animals, noting the difference between humans and non-humans, which is expressed mainly in the mental arena of existence. The notion of animals as property has become entrenched in the legal system, due to the influences of the early common law, anthropocentric biases evident in liberal theory and individualism, and Western religious doctrines. A shift in understanding is required to change this. That shift is supported by the recognition of animals as sentient beings having inherent worth or existential value. With the theory of evolution, there has also fortunately been an increase in moral understanding regarding the treatment of animals. This has lead to a call for the property status of animals to be abolished and for animals to be granted legal personhood. The non-property argument strongly acknowledges the existential value of animals, but does not adequately deal with the contribution animals have made to the development of human civilization because of their utility value. This is unlikely to change, and so human use of animals has to meet requirements regarding the animal’s individual and collective welfare, and the use must be for the general welfare of all. Allowance has to be made for a limited usufructuary right for human use of animals, consistent with a guarantee of their welfare, and recognising that animals have interests and rights in not being harmed and for their continued existence. This essay also explores that usufructuary right. The main characteristic of the animal world is that its species are mobile. Animals can move from place to place, whereas the plant world is immobile. 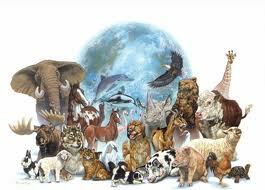 The animal kingdom can be divided into 21 phyla or divisions. Those animals having a spine fall in the chordata (chordates) phylum. This division is subdivided into 3 major subphyla, one of which is the vertebrata (vertebrates) subdivision. Human beings are mammals who are in the placental group, along with bats, mice, dogs, horses, dolphins, whales and primates. From another viewpoint, essentially the animal kingdom is made up of 2 main groups: animals with backbones (vertebrates); and animals without backbones (invertebrates). The number of species of animals is vast (and still unknown), with a wide range of features. The nervous systems found in animals, particularly in multicellular animals, also differ greatly in complexity between species. The human nervous system, glands and subglands, brain and other components of the human biological structure, are generally more developed than those of animals generally, including that of other 2-footed bipeds. This sophistication gives rise to greater mental propensities or expressions by human beings. As evolution progresses, the ability of humans to make decisions has become increasingly sophisticated and the nervous system and brain have evolved to levels where learning, memory and model-making becomes possible. Consequently, human beings also discriminate between what is proper and improper, applying values, by application of their conscience (the function of identifying good and bad, selecting the good, and directing mental energy towards that). This pathway of discrimination is called ‘rationality’. Rationality then takes priority over certain instincts relevant only to mere existence and survival. Accordingly, the human being has been described as a ‘rational animal’. But this is on par with saying that an animal is a ‘moving plant’, or even that human beings are ‘rational moving plants’. In this regard, philosophers have considered the difference between humans per se and animals generally, especially in relation to human mammals compared to other mammals and also compared to other animals as a whole. This difference arises from a shift of evolutionary proportions in consciousn ess. While humans, animals (non-humans) and plants all share some common characteristics, and while there are some characteristics that humans share with animals generally but not with plants, there are also some special characteristics that humans alone have. These special characteristics distinguish humans from animals (non-humans) and plants. Without them, humans would be like animals generally, but they are not. Furthermore, even though some animals (such as primates or domesticated dogs from being close to humans) have a somewhat developed mental faculty, the mental faculty of humans is far more developed. The special characteristics of human beings are not necessarily to do with physical or instinctual capabilities, as animals can also make use of tools and communicate, and they can ‘think’ in terms of processing information about themselves and their environment, at least at a rudimentary level. Rather, the special characteristics of human beings have to do with the mental apparatus of a human being, in terms of deliberately applying their cognitive ability so as to think consciously about themselves, as well as others, and their own place in the universe. This includes evaluating themselves in their personal, social and universal contexts and other forms of self-reflection. Accordingly, human beings are self-aware of their own identity. This self-awareness carries with it the ability to plan for the future by application of the analogue-I or doer-I (i.e. the ego) and to foresee possible consequences of one’s actions or even thoughts. In addition, self-awareness carries the capabilities of decision making and self control, perspective taking by considering the views of others and envisaging the lives of others, self-conceptualisation and evaluation, and introspection including internal contemplation into the depths of one’s existential-I (the I of I exist) such as in meditation. Thus, the difference between human beings and animals generally is at the psychic (mental) level. Accordingly, we can use the term ‘animals’ as referring to those creatures that are non-human, and refer to human beings simply as ‘humans’. The common law notion of animals as property also uses this difference to treat animals as things (not persons). This stems from William Blackstone’s mid-18th century Commentary on the Laws of England, which draws from Roman and Old Testament laws and cosmologies to proclaim animals as legal things rather than legal persons. This aspect of English common law has carried over to the common law in Australia. As legal things animals can be classified as personal property and so are denied legal rights. At law, this gives humans dominion over animals: “The objects of dominion or property are things, as contradistinguished from persons” (Blackstone). In this regard, the common law concerning domesticated animals is straight-forward in that they are personal property capable of being owned, and the early common law considered the owner’s right as absolute in the same way as ownership of inanimate objects. This also applied to companion animals and does so today, e.g. see section 7 Companion Animals Act 1998 (NSW) which recognises personal property in companion animals. However, while the common law regards both inanimate and animate objects as capable of being property, the forms of property are not necessarily equivalent. Developments in case law have shown that companion animals are likely to be classified as a special type of personal property, somewhere between a person and property, so as to take into account the element of humaneness implicit in the human-animal relationship. In relation to wild animals, Blackstone, drawing on Roman law and the decision of Sir Edward Coke in the Case of Swans (1592) which recognised a Crown prerogative in wild swans, stated that wild animals can be reduced to property. This happens when an individual takes a wild animal so that it becomes personal property (this was considered a natural right of every individual during Blackstone’s time), unless restrained by the laws of a country. Even without personal possession, wild animals which roam freely can be considered as property, not of human beings or private persons, but as property of the Crown or the State. This happens when ownership of wild animals is deemed to be that of the Crown or State, such as in legislation made to that effect. In such instances wild animals also do not possess legal rights, even if having special privileges of protection under the relevant legislation. After Blackstone, the anthropocentric approach of recognising the legal ‘thinghood’ of animals for the benefit of human beings was confirmed in the mid-19th century English case of Blades v. Higgs. Legal ‘thinghood’ describes an entity with no capacity for legal rights, whose interests are not required to be respected, and where the owner’s interest in the thing is protected. In the Blades case, Lord Chelmsford concluded that when a wild animal is caught or killed it becomes the personal property of the hunter. Accordingly, qualified property could be acquired over wild animals by lawfully taking, taming or reclaiming them. Even if they regained their natural liberty, their ownership would rest with the Crown or State. In the USA, the United States Supreme Court in the case of Geer v. Connecticut in the late-19th century held that wild animals or game are to be treated as the subject or ownership of governmental authority. This case was later partly overruled by the Supreme Court in 1979 and its ‘ownership’ language was taken to refer to no more than the State’s power to regulate for the preservation and exploitation of an important resource (which still denotes human control over animals). However, the common law in the various American States do still recognise that wild animals while belonging to no one (or to everyone in common) can, in lawful circumstances, still be made the property of the first human who possesses them, unless otherwise protected by wildlife legislation. The same applies when wild animals are tamed. This is a qualified or limited property interest in wild animals, as the nature of wild animals renders them incapable of absolute ownership. If such an animal happens to regain its natural liberty, the human property interest in it will also cease. The common law assumes that the interests of an animal do not exist or do not matter. At most, the only duties humans have towards animals are indirect ones, such as not being cruel to animals and maintaining the welfare of animals for human benefit, which today tend to be imposed by legislation. The result is that animals have no rights or a place in the sphere of rights. They are excluded because they lack self-reflective awareness and means for rationality in order to reason. This lack of personal autonomy deems animals to be unable to participate in a system of reciprocal rights and obligations developed for a community or society. On this account, only rational beings have merit for participation in such a system and community. At law, the status of animals becomes such that they have no inherent moral worth and so become things or instrumentalities for the satisfaction of human needs. As things, this gives the legal justification for human practices such as animal husbandry, harvesting and killing of animals for food, animal experimentation, genetic engineering concerning animals, and use of animals in entertainment (such as zoos, circuses, rodeos, sports and the like). The anthropocentric prejudice of the common law, and its legislative equivalents, today continues to be bolstered by a version of liberal theory associated with the influential 20th century American political philosopher John Rawls, which ends up excluding animals from a theory of justice. This relies on a political conception of justice taking primacy and being applied, rather than a comprehensive or broader ethical application of justice. Under the political conception, only beings who can understand what it is to be just (because they are persons capable of a moral conception of their good in life with a sense of justice) and are able to make claims to justice for themselves and to respect the rights of others (because they are persons with a desire to apply and act upon principles of justice), are entitled to be actual beneficiaries of justice. This excludes animals because they do not qualify as autonomous individuals with the required capacity for rational self-determination. Also, it is only autonomous individuals who are able to assert property rights. This is in line with the socio-political theory of individualism and its self-reliance against the interference of the state and society, which further supports strict property law. Such laws may even be a hindrance to enforcement of anti-cruelty laws, because of the pervading assumption that there has to be good reason for interference in property rights, including property rights in animals. These influences can also make legislative improvements in animal welfare difficult. However, where the political and lobbying influence of individualism is less powerful (compared to the United States), the community may more readily defer to a majority view such that individual rights do not stretch so far as allowing an absolute right to property in animals by humans. The point is that the law does not have to accept a fixed dogma about property and the relationships it gives rise to. The law can be open to a legal status for animals based on humans and animals being bodies of discrete individuals and at the same time co-members of an ecological community. Religious doctrines may however impede development of progressive change in the law. Religious doctrines have influenced the law on the legal status of animals and in determining the lives and deaths of animals. Part of religious doctrine, as resorted to by Blackstone, includes human dominion over animals. On this point, a long pervading Western religious idea (mainly from the time of Hellenic Greece to the 19th century) has been that the universe is divinely designed in a linear hierarchy, known as the Great Chain of Being, for every entity that exists or could exist and for the ultimate benefit of humans. It is a human-centred construct signifying human dominion over every earthly creature and of nature itself. This is mirrored in the Judeo-Christian view found in Genesis, which is taken to be the divine source of humanity’s claim over nature and animals. Excluding animals from legal entitlement is also evident in the book of Genesis when it proclaims that the Earth and all Earth’s non-human inhabitants are for human’s to rule. As can be seen, from these early times there has been an essentially Western theological basis, continuing throughout history, for humans denying animals any legal rights or legal recognition. It has had constitutional significance, as well. In relation to animals, many countries still allow ritual slaughter on the grounds that to abolish it would offend the principle of religious tolerance. Ritual slaughter is allowed even though there is obvious evidence that it causes unnecessary suffering that is easily remedied. On this point, the United States Supreme Court has essentially held in Church of Lukumi Babalu Aye v. Hialeah, that religious freedom prevails over concern for animals. In this case, the scope of certain Florida ordinances made under anti-cruelty statutes prohibiting ritual animal sacrifice were held to be unconstitutional as they violated the free exercise of religion. Consequently, the religious rites of the Santeria religion which required the sacrifice of animals by cutting their throats prevailed. While dominant world religions do also preach compassion and responsibility towards animals, they all favour the inherent existential superiority of humans over animals. However, Buddhism is often viewed as more reasonable in its view of animals, as most forms of animal exploitation are against fundamental Buddhist teachings, although many Buddhists do participate in activities which involve killed animals. Notably, the strongest religious advocates for the sanctity of animal life are the Jains and Vaesnava (Vaishnavite) religions, which espouse the avoidance of hi?sá or intentional harm towards any living being and require adherents to be vegetarian. Generally, Eastern religions accord greater respect to animals. Many Eastern religious doctrines impose restrictions on the taking of animal life and value its intrinsic or existential value more, e.g. as is the case in Tibetan Buddhism. This invokes a concept of stewardship, in the sense that human beings have a responsibility for preserving the welfare and integrity of the natural world, including animals. Aspects of this are also sometimes asserted in relation to Judaism and Christianity, and adherents will argue that it is the modern secular notion of human progress, and not religion, which is more an impediment to the protection of nature and animals. Darwin’s theory of evolution challenged Western religious doctrines, but it also had elements of support for the dominion of humans over animals. This is because natural selection is a process that favours the survival of organisms (such as humans) that posses certain advantageous features over other species. The so-called Social Darwinism of the 19th (and early 20th) century took this to the extreme by proclaiming that human beings have a right to lord over the rest of creation. However, Darwin’s theories in their full context saw an interdependent society of organisms that includes humans bound together in a web of complex relations. Darwin also admitted that there should be respect for humans’ fellow creatures and this respect characterised a civilized people. These moral sympathies were also a product of evolution. Furthermore, Darwin thought that the application of ethics encompasses all sentient beings who should ultimately be included in the moral community. This is based on a sentient being having an ‘I’ that has subjective experiences, particularly the internal capacity to experience feelings of pleasure and pain. On reflection, it appears that the law has not fully kept up in the area where science meets ethics. This risks the continued validation of misconceptions being entrenched in legal and legal policy frameworks. This includes entrenching the “secular expression of species pride” of humans. While the psychic / mental capacities of humans are generally considered as being superior to other existing creatures, this should not lead to actions that contribute only to human welfare, no matter how little the apparent (or known) contribution or relative deficiencies of other creatures. There is no social or evolutionary reason why human beings should not accord inherent value to other creatures. Rather, it has to be recognised that all living beings have some inherent or existential value, simply because they are alive. Recognising only utility value is not enough. Even where the interests of humans and other creatures (animals) come into conflict, or need to be prioritised, or human actions cannot practically elicit moral restraint from animals, humans can still extend moral consideration to them. This is consistent with taking an ethical approach towards all sentient beings that Darwin espoused. Few thinkers would today deny that many animals are sentient (especially those in the vertebrates subphylum or even the whole chordates phylum), that is, they have ability to feel and, to a certain extent, think and communicate. As a result, at least these animals have interests they would instinctually seek to protect, and that ought to be taken into account in any moral calculation by humans. The same applies for any resultant legal framework that is put in place. So, despite the case that animals lack the self-reflective awareness and other capacities of the human psyche, there are certain capacities that are shared amongst humans and animals (even if the degree varies). Notably these are understanding their experiences of pleasure and pain and similarly the capacity for suffering, and the will to survive and continue their existence. This means animals have morally significant interests, particularly the interest in not deliberately having suffering or harm imposed on them and the interest in their continued existence. Recognising these morally significant interests of animals leads to the conclusion that rational human beings owe an obligation to animals as non-rational beings, even though animals are not capable of providing reciprocal obligations towards human beings. Given that the species of animals range from unsophisticated to sophisticated (but not to the degree of human sophistication), it would be vertebrates as the more sophisticated animals to whom obligations are primarily owed by human beings. In a sense, such animals can come within the scope of the social membership of human beings, especially when it is recognised that human beings have obligations towards animals. Conversely, this gives animals entitlements or rights, especially that of being free from exploitation and a guarantee of their security. Practically, this type of guarantee requires an assurance of the minimum requirements of life for at least developed animals. In addition, sustainable amenities, such as environmental amenities, need to be provided to these animals. The range of amenities may even need to increase over time as the psyche of some animals develops further, e.g. an increase of intelligence in primates. The dignity of existence or existential value of all animals has to be recognised. This is an essential step for consideration of animal interests on par with human interests and for the welfare of all creatures. The prospects for protecting animals have to be increased. Lack of regulatory resources to enforce animal welfare and anti-cruelty legislation can result in the fundamental interests of animals often losing out to relatively trivial human interests. Also, these laws usually depend upon proving unnecessary suffering or that pain has not been reasonably alleviated, which can be difficult. Whereas, it should be clear that animals are not to be subjected to pain and suffering for the furtherance of human interests. As animals also experience pain and pleasure (given they have a nervous system) they should receive some moral consideration, and intentional harm or death of an animal is to be avoided. Animal welfare and anti-cruelty legislation may be more concerned with the moral improvement of human beings. Whereas, what is required is a direct concern to protect the interests of animals. Legislation enacted as a mere legal constraint to deter inhumane behaviour, while useful, is insufficient to advance the overall welfare of animals. While an animal remains personal property, it cannot have a proper entitlement of rights because it belongs to someone else. In particular, such animals are denied the natural right to be free from exploitation or the right to be left alone (unless intervention can be justified) or fundamental rights concerning bodily liberty and bodily integrity (or any necessary adjustment to such rights taking into account the circumstances of animals). Abolition of the property status of animals is required for fulfilment of animal rights and for animals to be morally considered alongside human beings. Ownership of animals implies full entitlements to the owner, whereas at best this should only be in the nature of a usufruct or privilege. Utilization of an animal by human beings (because of the animal’s utility value) must also ensure the individual welfare of the animal. As well, utilization of animals by human beings should not be detrimental to the collective welfare of that species of animal, even though utilization of the animal(s) is for the good of human beings. Legal standing is required to enable animal advocates to assert the interests of animals in the judicial system and to sue on behalf of animals. This is necessary in order to remedy harms that animals endure by the conduct (or lack of conduct) of human beings. The remedy can include injunctions in favour of the animal plaintiffs. On the other hand, it is arguable that significant improvements to the welfare of animals can still be achieved from within a property status paradigm, as abolition of the property status of animals does not of itself guarantee that animals will cease to be exploited to their detriment. Property rights or any rights are not absolute, rather they give legal form to what society is willing to acknowledge, defend and enforce. There are always occasions for intervening in rights in order to protect other rights. Similarly, the promotion of individual interests can be better achieved when motivated by the promotion of collective interests or the general public interest. This could be by the maximization of preferences or through obtaining other valued human outcomes. Also, personal property rights are not necessarily incompatible with the welfare or protection of animals, because the laws of a state can sanction interfering in such property rights in order to benefit animals. This can even be to the extent of prohibiting ownership of animals by specified persons and/or in specified circumstances. In this regard, anti-cruelty legislation can “trump property rights when they conflict”. Legislatures are not prevented from giving certain animal interests greater weight than has been accorded to date under the property status paradigm. Whatever the way forward, and whether it requires abolition or dilution of personal property rights in animals, there is no reason why animals cannot be incorporated into a system of justice, which provides for an enhanced legal status for animals. The human treatment of animals should not be left largely as a matter of individual moral choice based on moral pluralism, where the state does not intervene to impose one moral code over another on the basis that the treatment of animals is considered a self-regarding action (i.e. that does not involve anyone else except oneself). Actions involving animals, particularly those that exploit or harm animals, or that deny their continued existence, have to be considered as other-regarding actions (i.e. they do involve someone else), even if that other is just an animal. Just as in the case between human beings there are rights (and obligations) which protect human beings from each other, similarly animals need protecting from humans. This can be consummated by placing the claims of animals before a court (whether the claim fails or succeeds on its merits).